Glenwood Springs, CO, an hour away from Aspen, is a great place to bring the family for outdoor recreation (hiking, fishing, skiing, snowmobiling) as well as many exciting attractions. Glenwood Springs, Colorado is a mecca of outdoor fun, providing a relaxed mountain atmosphere combined with a number of thrilling attractions for the entire family to enjoy. 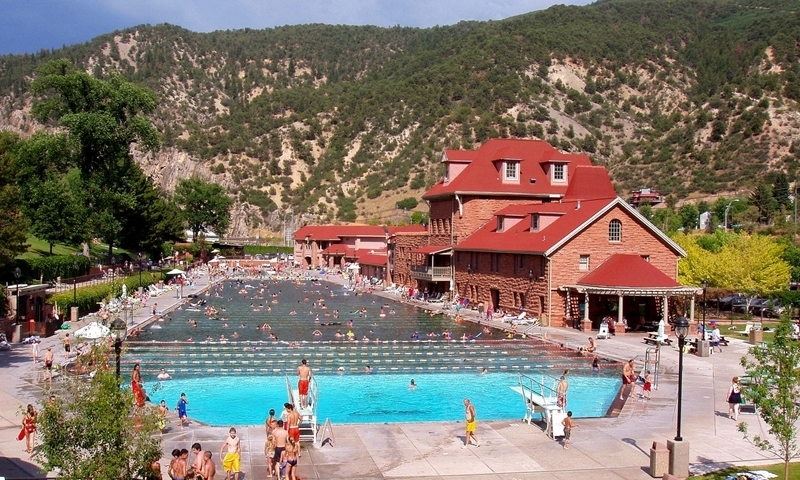 Glenwood Springs is off of I-70 at exit 116, 157 miles west of Denver. On a Glenwood Springs vacation, you can handle your hunger when in town with a number of options for a wide variety of taste treats. You can try Italian, Cajun, Mexican or Chinese cuisines, or grab a quick snack and be on your way. Have a pizza or burger, or sit down to some fine dining in an upscale eatery. From a ranch surrounded by wilderness to a quaint cabin on the river, accommodations around Glenwood Springs will surprise you with the wide array of choices. Get a luxury suite at an inn or stay in town at a quiet Bed and Breakfast. You’re sure to find the perfect place for you! You’ll find trails galore around town, some even paved, making an easy time of wandering through the heart of the Rockies. Hike to Hanging Lake or travel the Glenwood Canyon Trail through stands of pines with marvelous views. With so many rivers, lakes, streams and reservoirs, you will find catching trout has never been easier. Within a short distance of town you’ll have many places to cast a line. Go all out and try your hand at whitewater rafting. The Colorado River offers some of the best rafting trips, and there are a number of outfitters who will provide a guide and gear for a safe trip. Sweeping views of the Rockies are yours when you soar into the clouds in a hot air balloon. Listen to some classical music as you fly, setting the mood for the amazing scenery. Enjoy downhill skiing at the Sunlight Mountain Resort or take to the backcountry on miles of groomed trails for great cross-country skiing. A snowmobile tour may be just what you need for having the complete vacation experience in the Rocky Mountains. When you have an experienced guide lead you on an adventure through the white landscapes, you learn more than you expect about the region. A favorite in mountain adventures is taking a guided tour of the Glenwood Caverns and Fairy Caves in Glenwood Springs. You can explore underground rooms, learn the history of the caves and watch the water drops twinkle like little fairies along the cavern walls. A short hike takes you to this beautiful lake, where you will find breathtaking views and the cleanest air imaginable. Relax after a long day of sightseeing at the hot springs pool. The water is always at a comfortable temperature and clean. It’s healthy to soak in the mineral-rich waters. Step back in time by visiting the gravesite of Doc Holliday, famous for his part in the gunfight at the OK Corral. To get to Aspen from Glenwood Springs, simply get on Highway 82 and head south and you’ll reach Aspen in about 54 minutes. A beautiful drive, too! The Frontier Historical Society of Glenwood Springs strives to preserve local history and heritage. Stop in the town of Vail Colorado, along I-70.